I’m the handsome fellow on the right. Mommy tells me I’m a really do boy with a super great personality and temperament. I share my toys with everybody.Contact mommy Fern for details about how to adopt me…I’ve been adopted already but check out more babies adoption dates. 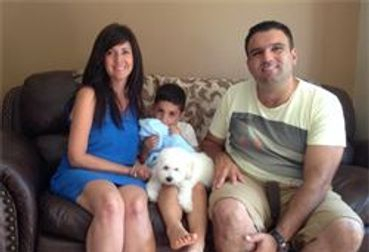 Huxley here…I’ve found my forever family. Awhoooooo woof woof I so happy. I may not have smiled in my family picture but my tail was wagging before …. My new brother is hugging my blankie. 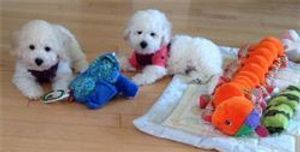 I got a toy and a bone too but it’s not in the picture — at Bichon Lovers angels where dreams really do come true.